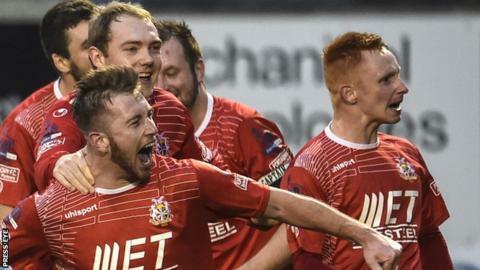 Portadown sealed a crucial win with two late goals against Glentoran who finished with nine men as Calum Birney and Stephen McAlorum were sent-off. Mark McAllister got in behind the Glens defence to give the Ports the lead just before half-time but David Scullion chipped a fine equaliser on 53 minutes. Birney got a second yellow card for hand-ball but Chris Casement put the resulting penalty wide. Gary Twigg made it 2-1 and Casement got the third with another spot-kick. McAlorum then got a second booking for kicking out at Ports full-back Casement. Despite the win, Portadown have been knocked off the top of the table by champions Cliftonville who lead on goal difference after a 7-0 win over Ballymena. Portadown manager Ronnie McFall: "It is always a hard game against Glentoran and it took us a while to get into the game. "But three super strikes earned us three points. I always thought we were going to win. "Chris Casement showed a lot of character in stepping up to take the second penalty after missing that first one and he put it away with some aplomb." Glentoran manager Eddie Patterson: "The two players who were sent-off will be dealt with internally by the club as will those who showed dissent. That is club protocol. "We got caught out by a high ball for the first goal. We scored a good equaliser but then disintegrated. "But I thought the turning point was a two-footed tackle by Chris Ramsey. It came early in the game and it should have been a red card."